so whats a good gun to get to start that i can gradually upgrade as and when money comes in so theres no need for me to go out and buy a new gun, and i know i can get them cheaper from importing but what are the runes on having them shipped into the country? Best to post your absolute max budget so people can advise with more detail. dont forget to factor in the mags etc in your budget. You can get bargains if you search the forums often. I am very good at getting lucky with guns and kit from forums and local surplus stores. I'm not in any rush so I can pick things up gradually. And I just sold my gas 177 pistol so budget atm is 100 and where do you stand on plastic guns? Like let's say getting an umarex ump with full metal gearbox and a poly body? Shame you just missed out on my ICS M4. Good quality plastic guns are OK. I would not buy one for a regular gun personally. The G&G range are meant to be good for cheaper starter guns. but they don't meet my budget LOL. And as far as I know hk is a good brand. My mates one was all plastic except the inside and he added a metal barel.ris and stock and its such a nice weight now. And its endured a lot. any way if it is as they say it is I don't see a problem but before you get it ask the guys at the shop what make it is because in my experience if they don't tell you the make they are hiding something more! There is an actual company called HK. The real gun company is called H&K. 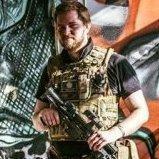 Go for a G&G rifle, their starter range are good enough for the longest playing airsoft veterans to buy and be satisfied with, they are spectacular value for money, have very good performance and the build quality is faultless, I expect what you pay for a G&G starter gun from some of the higher end guns in the £300 bracket and suffer greater disappointment. There's also a good range of choice, M4s, AKs, MP5s - all the most recognised platforms. You'd be looking at £140ish for a standard M4 + batteries and accessories etc. One thing I will say though, hiring is more cost effective than buying a two tone gun. Let's say it costs you £40 per trip to hire, you need to do that 3 times to be able to buy your proper gun in real colours, so you play 3 times for £120 and then you buy a properly coloured gun, that you actually want. If you buy a two tone, it will cost you more than £120 to buy the gun, you then still have to pay the fee to play on the site, which is usually around £20 per trip, so you'd be looking at about £150 for the gun, + £60 for your three trips, that's £210 before you even get UKARA. Then once you get UKARA you'll want a proper colour gun, so you'll either paint your two tone and have to deal with it - in which case fair enough, if you don't care about getting a RIF then definitely get a two tone. If you're unhappy with a two tone and want a proper RIF though, then you'll either buy a second gun, or sell the first and use the money to buy the second, both of which will obviously cost you more money than just waiting until you've played 3 games and buy a RIF from the off. So I'd say just stick with it until you have UKARA, that's what I did. Is waiting really so bad? It gives you more chance to read around and see what you want to buy, as well as ask people at your site, watch videos on YouTube, ring the retailers etc etc.